I have a new Apple TV, which, as you know, has no hard drive for storing media. I keep my music and videos on my Mac Pro in the office downstairs. It seems like a massive waste of energy to keep that computer running just so I can stream content from it to the Apple TV upstairs. There must be some way you can put that Mac mini attached to the TV to good use. Indeed there is, Chris. When initially setting this up I suggested this workflow on Twitter—Encode:MacPro -> Copy to mounted MacminiMediaServer. ScreenSharing btw Pro&mini -> Remotely copy into mini’s iTunes lib. In long-hand that means obtaining and encoding media on the Mac Pro (because it’s far faster than the Mac mini and is the computer I most often work with), mounting the Mac mini’s startup drive on my Mac Pro, copying files to the mini, switching on screen sharing so I can see the mini’s screen, and then manually copying the transferred files to the mini’s iTunes library. Almost instantly, better solutions came my way. One was to use Noodlesoft’s $22 Hazel. This is a preference pane that lets you assign rules to folders. 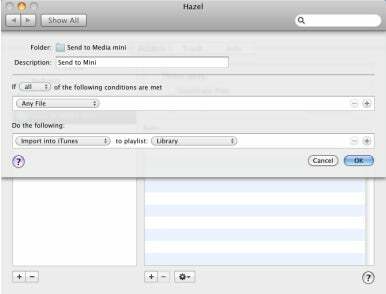 In my case, this would mean creating a folder that transfers any files dropped into it to the mini’s iTunes library. I tested it and it works as advertised. Even if you don’t perform these kinds of chores, it’s a tool worth having. Travel to youruserfolder/Music/iTunes/iTunes Music and you’ll find the Automatically Add to iTunes folder. Anything you drop into this folder is—as the name implies—automatically added to iTunes. All I needed to do was to mount the mini’s startup drive on my Mac Pro, make an alias of that Automatically Add to iTunes folder, and place it on the Desktop. When I needed to transfer music or video to the mini, I just dropped it on to the alias. That content then copied across the network to the mini and moved into the mini’s iTunes library. When it was time to watch something on the Apple TV, I could then shut down (or sleep) the Mac Pro and instead stream from the mini to the Apple TV, which is a more energy efficient solution than streaming from the Mac Pro. Icing the cake, I can set the Automatically Add to iTunes alias as the destination for any DVDs I rip with Handbrake. When the rip completes, the resulting movies or TV episodes are transferred to the Mac mini’s iTunes library.